The Jigawa State Pilgrims Welfare Board (JSPWB), has organised a “train-the-trainer” programme for 97 facilitators to train the state’s intending pilgrims for the 2019 Hajj. The Public Relations Officer of the board, Alhaji Ibrahim Hasheem, made this disclosure to newsmen in Dutse on Thursday. Hasheem said the facilitators, comprising of 61 males and 36 females, were drawn from the 27 Local Government Areas of the state. He explained that the facilitators would in turn train the intending pilgrims at designated centres across the state. The board’s spokesman pointed out that the gesture was to ensure proper training of the pilgrims on the basic tenets of Hajj. 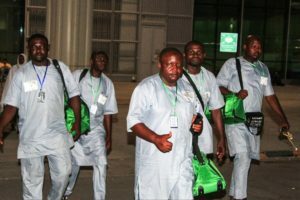 “The facilitators are mandated to train prospective pilgrims on obligations, tenets and cardinal principles of the Hajj,’’ the spokesman said. According to him, proper education of pilgrims will prepare them to conduct the Hajj in accordance with the teachings of Islam; to be good ambassadors of the country. Hasheem added that the training would also give the intending pilgrims the opportunity to know proper and acceptable Hajj rites. He, therefore, advised the pilgrims to attend the training in view of its importance.